TuneFab WeTrans, a professional iOS data transfer, is capable of transferring music, video, photo, podcast, audiobook, ringtone and more from computer to iPhone or vice versa. 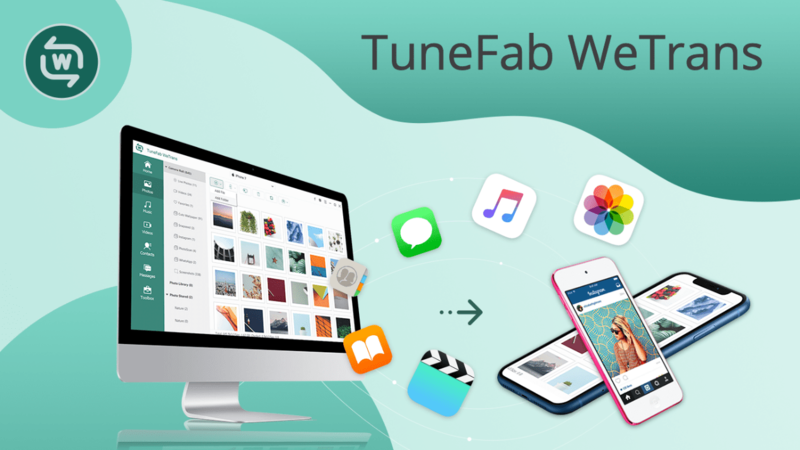 If you are looking for a solution to add music to iPhone without iTunes, then TuneFab WeTrans will be your best option. It supports almost all iPhone models including iPhone XS Max, iPhone XS, iPhone XR, iPhone X, iPhone 8, iPhone 7, iPhone 6s, iPhone 6, etc. Unlike iTunes, this program will not erase the music stored in your device. 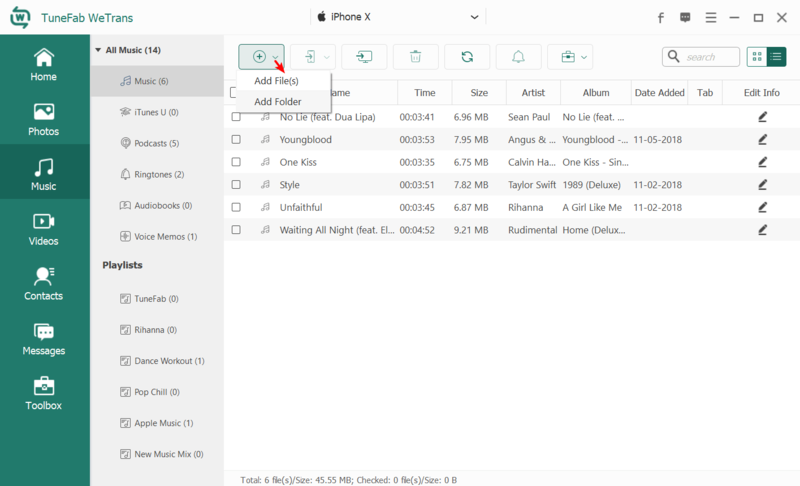 With this software , you can transfer your songs from PC to iPhone or you can transfer your iPhone music back to computer. To help you fully evaluate the program, TuneFab provides the free trial version of the TuneFab WeTrans and you will have 30 days to use the program for free. The main interface of TuneFab WeTrans is simple. From the main screen, we can find out that this program supports transferring different media types, including photo, music, video, contact, message, etc. And there is a section named “Toolbox”. 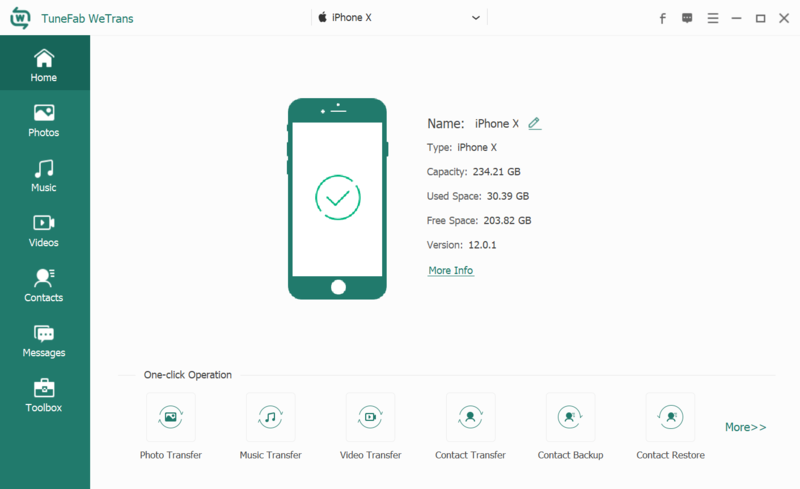 You can use the quick access in this section – for example, you will find the iPhone ringtone maker, or HEIC photo converter, etc. from the “Toolbox”. You have different options when it comes to sync files between iOS device and PC. 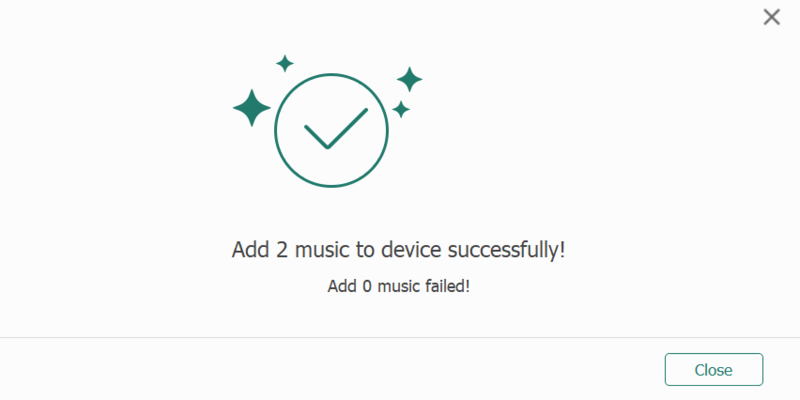 For example, you can transfer music from iPhone to PC, you can transfer songs from computer to iPhone or you can sync music between iOS devices. You don’t need to use iTunes anymore because this program will help you directly transfer music from one device to another. You can directly put any music you like from PC to iPhone. This program will let you export contacts and messages from iPhone to PC. You can save them as CSV file if you like, or you can directly sync contacts and SMS between your iPhones. TuneFab WeTrans is a great iPhone ringtone maker that lets you make customized iPhone ringtones from your songs. Any song added from iPhone or PC can be made into M4R ringtone. What’s more, it helps you transfer ringtone to iPhone directly. Even if you are not an expert computer user, you can easily handle this software. It only takes a few simple steps to complete the music transferring process. Download, install and launch TuneFab WeTrans on PC. When you see the main interface pop up, you can connect your iPhone to PC with the USB cable. Then the program will automatically detect and connect with your device. When your iPhone is connected successfully, you will see the basic information of the device show up in the main screen, including Name, Type, Capacity, etc. And you can click on each category in the left column to preview your media files. If you want to add music to iPhone, you can go to the “Music” category directly. You can select “All Music” and choose one playlist to store your imported music files. Then click the “+” button to add files. When you have selected all the songs you want to transfer to iPhone, click on “OK” button to start transferring. So, how does Tunefab WeTrans sound? If you want to know more about this software, you can download the free trial version to fully evaluate the features. It really makes syncing music to iPhone a much easier job. 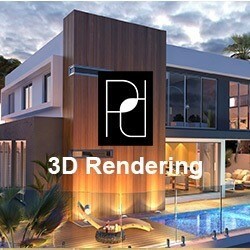 Don’t miss this fantastic tool!